In this video, we explain what Joomla is. Joomla's goal is to make it easier to put your content online. What does that mean in pratice? In this video, you'll learn how to create a plan for a Joomla site. Our plan to build the site for a city called Joomlaville. This plan will take us through all seven steps of the Joomla workflow. In this video, you'll take a tour of the Joomla administrator interface. You'll learn about all of the main areas of the interface, including the dashboard, main menu, extensions and more. In this video, you'll learn about the Content Workflow for Jooma: CASh: Categorize Add Show This process will help you quickly build categories, articles and menu links. In this video, you'll see how to create categories in Joomla. Following the plan from earlier videos, you'll create categories called About, Attractions, Festivals, Transportation and more. Rod also gives his recommendation for how to deal with the "Uncategorised" category. It seems the video skips making the Welcome to Joomla article, this is used for the index page, which is shown at 4'38". The text for the article is also from the book but Chapter 4. You can make this now and set it as a featured article so the pages look the same. It is covered in the video "How to Use Featured Articles". In this video, you'll see how to use the formatting options in Joomla's text editor. You can add bold and italic text, plus bulleted lists. You can also add Tags to categorize your content, decide when your article is published and add metadata for search engines. Minor changes are made to the Climate article and tags are added. At 2'42" it seems as the name of the climate article gets changed to Joomla Overview. You have completed Parts 1 and 2 of the CASh workflow. In this video, you'll complete Step 3: Show. You'll see how to create menu links to show your content to visitors. You are creating menus for each of the categories to appear in the left sidebar. At 4'03" it has you select the Joomlaville Overview article for the menu. This was previously the Climate article. In this video, you'll create a blog layout which shows several articles. A Category Blog will automatically update to show all the new articles in a particular category. You'll also see how to add a "Read More" link and set up teaser versions of your articles. In this video, you'll create a list of articles in a particular category. As with the previous examples, you'll create a menu, menu links and a module. This is the view after changing the List Layouts options for the menu. In this video you'll write a "Welcome to Joomlaville" article that will appear on your homepage. To make this work, we'll use the Featured Article option in Joomla. This is shows the new Fesitvals Menu. In this video, we finish up the CASh workflow that we planned earlier in the class. This involves adding several articles to a new menu. You'll also see how to rearrange modules. In this video, you'll see how to upload, organize and add images to your Joomla site. You'll see how use the Media Manager, insert images into articles and how to use the "Intro Image" feature. Your page may not look the same as you need to find your own museum image. In this video, you'll explore Joomla's Article Options. These allow you to set the global options for your site, although you can also override them on individual articles. This is the preview at 2'57". The text on your page may not match exactly. In this part of the class, you'll learn about Joomla's core extensions. In this first video, you use Banners component that allows you to show advertising banners on your site. Breadcumbs and Banner need to be switched and your link should function. The Contact component allows you to create contact forms for your site. Your contact forms can contain email addresses, phone numbers, addresses and more. The following show the new Contact Us menu item, the contact page and the contact information for the mayor. You will need to find you own image for the mayor. When a Joomla update is available, a message will appear in your administrator area. The Joomla Update component allows you to update your site smoothly with just a single click. Note: you won't have to use this component if you're using the Joomla demo site. The demo site is automatically updated for you. The Messaging component allows you to send private messages between users. These users must have at least "Manager" status on your Joomla site. For the grade, show me that you created a new user. The News Feeds component allows to use RSS Feeds to show news from other sites. After you have set up the News Feeds, the news will be automatically updated. The link should show on the Joomla home page in the Main Menu. The Redirect component collects all the broken links and 404 errors on your site. It stores all those bad URLs and allows you to redirect them to URLs that do work correctly. The Search component offers a simple search for your site. You can allow your users to use the search via a module or a menu link. The Smart Search component is more powerful alternative to the normal Search component. Smart Search offers "Advanced Search" options so that visitors can drill down more accurately. You can also create completely custom Search Filters. Note the order on the menus is different in the video. You may need to reorder the menus on the Modules screen so Search is above About. To show you created the filter search zoo as he did in the video. In previous videos, we've created modules. In this video, you'll learn much more about modules. You'll see how to position modules in different parts of your site and how show them on certain pages. The Latest Articles menu is below the Main Menu. In the video it is above it. Positioning can be changed in the Module screens and is addressed at 5'26". The Welcome module in addition to the Most Read module. The Welcome module is gone after logging in. You must set the Access to guest. In this video, you'll explore plugins. The plugins are easy to ignore, but play a very important role on your site. Plugins enable everything from authentication, to editor plugins, caching and much more. The welcome module moved to the bottom of the article. The Language Manager allows you to translate your Joomla site into other languages. With a single click you can install translations that range from Afrikaans and Albanian to Vietnamese and Welsh. Please add Spanish as a site language. Show me this screen. Example of the language override in the login module. The best place to find new extensions for your site is the Joomla Extensions Directory, or JED. The JED provides lots of information about each extension so you can easily decide which one is right for you. Some of the extensions on the JED are free, and some you will need to pay for. Show me your editor to verify JCE was installed. What is a Joomla Template? In this video, we'll introduce you to Joomla templates. What are templates and where can you get them from? In this video we'll show you how to download and install a template called Breeze. This is the example template that we use in many of our Joomla video classes. You'll see how to install and configure a new template, putting modules into the correct positions and setting up your menus. Find and install a different template. Show me when you are done. Change back to the Breeze template. Now that you have your template set up, we'll show you how to modify the color and design of the template. Each template will have different options, ranging from the very simple to the very complex. This is one of the final videos in this class and we're going to tidy up and complete some of the work we've done so far. You'll see how to place your modules in the correct position and also upload a logo and some images. 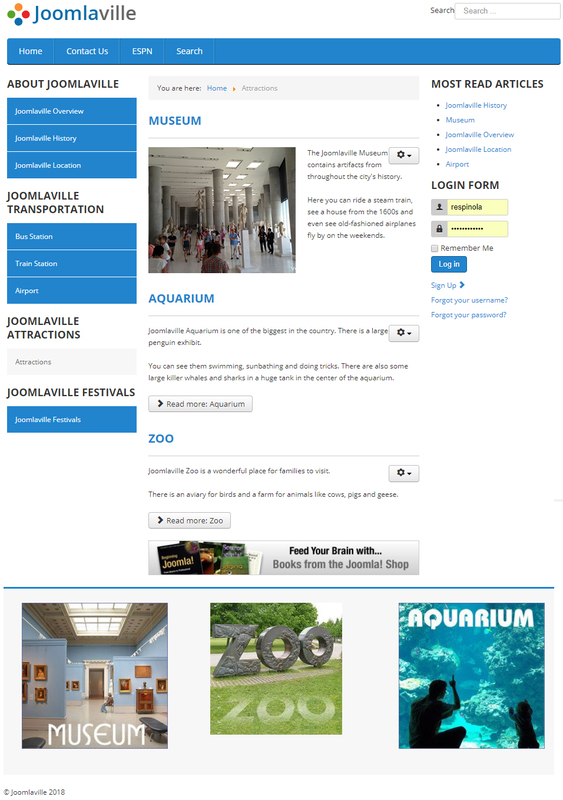 The Joomlaville Logo at the top of the image and the Attractions footers at the bottom. In this part of the class, we're going to talk about creating accounts for your users. You'll see how users are created and how you can control their basic options. By default, user registration in Joomla is disabled. You can enable registration to allow people to join your site. In this video, you'll learn how you can manage the registration process for your Joomla site. Show me the screen after you have signed up a new user. In the final video of this class, we'll show you how to maintain your Joomla site and keep it safe. You'll see how to take your site offline, run updates and protect your logins with 2-factor authentication. An extension which is around since 2006. Millions of downloads. Countless praise in the Joomla! Extensions Directory. Three J.O.S.C.A.R. awards. A single goal: backup, restore and transfer your site in a snap! In this class we show you how manage a Joomla 3 site. Rod explains user access control. He also shows you how to maintain, backup, update and move your Joomla site. How to login to Joomla! How to create a website with Joomla! How to change/install Joomla template! How to install Joomla extensions! Log into the admin area from the email you received. Choose one of the sites at https://wordpress.org/showcase/ to replicate. Show me the site you are using. Recreate the layout of the site, not the content. You must have a minimum of 5 pages. Use at least five plugins of your choice. One can be a backend utility such as a page editor. You must edit the CSS. Create notes as proof of the edits. The content (including images) cannot be placeholder or filler. If you can't think of a site to make, create a website for a food truck. Add social media buttons and feeds. You must watch and follow one of the following tutorials or find one on your own. Minimum length is 1 hour or a combination of tutorials exceeding 1 hour. social media feeds for at least two social media platforms. I saved a folder to your network directory to use for the menu. The directory "fix1" or "fix2" is in your folder. The home page needs to have two columns side-by-side. The pics page needs to have the images arranged 3x3. The directory "fixthis" is in your folder. Copy and paste the code into Brackets. The picture areas needs to be centered on the page. This company https://ocgcreative.com/ designed Chihuahuas site https://chihuahuasgrill.com/. Look at the different types of employees they have https://ocgcreative.com/reno-internet-marketing-team-2/. Please include background colors for each area. Create mysite folder with an assets sub directory. Save all site files there. Your layout will be similar to images below. You will receive a weekly grade for your progress on your site. Evidence of progress will be notes you make in your code. You will also be saving screenshots of both pages of your site. One needs to be full screen and the other mobile. Make a new page to hold the pics so they can be uploaded to your site. The files will be saved as the date and the page. For example, "12-11-18 index full.jpg" and "12-11-18 index mobile.jpg" and "12-11-18 sub full.jpg" and "12-11-18 sub mobile.jpg". Wrapper (container), Header, Menu, left and right content areas (main and sidebar), footer. Divide the footer into three columns using a grid or divs. Add divs to the sidebar. Build only the index page and one sub page. This means a page with actual content. The nav bar in the menu should be responsive and have at least one dropdown. Just use <a href ="#">Link</a> for the links for now. Appropriate CSS for all classes. Organize your styles by order of appearance in the page. Create several heading styles as well as styles for text in the body. Responsive for desktop, tablet and mobile. Use place holder images and text https://loremipsum.io/ and https://loremflickr.com/. Upload using Filezilla to the Go Daddy server. I will supply the FTP info. Create a custom logo for your business. Must have a caption on the pictures and must be linked. Once installed change the account from lowryhighschool and change some of the settings such as width, header, data, etc. Step 2: Place this code wherever you want the plugin to appear on your page. The code above inserts a the stream below. <a class="twitter-timeline" href="https://twitter.com/LowryHigh" data-widget-id="543900127291658240" width="300" height="400" data-link-color="#0066ff"
Use the shared google doc for the directions and save when instructed. Save each tutorial as a new file, e.g. index1.html, index2.html, etc. The right div needs to be the same height as the two left divs combined. Learn HTML: Get started as a web developer by learning the basics of HTML, the essential language of the web. Styling a Website: Learn and practice the fundamentals of CSS to add beautiful styling to your webpages. Getting More Advanced with Design: Learn CSS techniques for more interesting sites: display & positioning, colors, typography, responsive design, and flexbox.